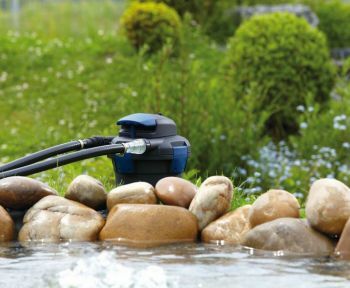 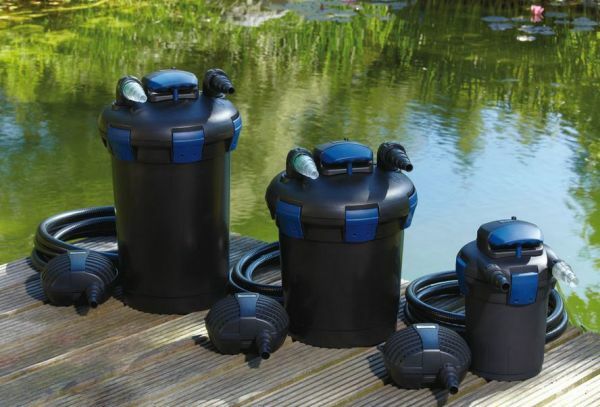 The BioPress Set 6000 is a complete pressurised pond filter system including solids handling FP2500 filter pump, BioPress 6000 pressurised pond filter, integral 9 watt UV Clarifier and 5 metres of 1" internal diameter flexible hose. 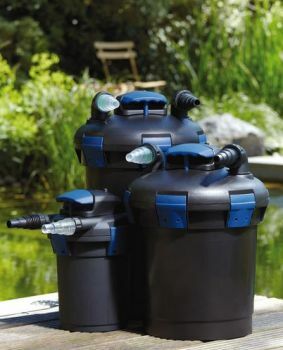 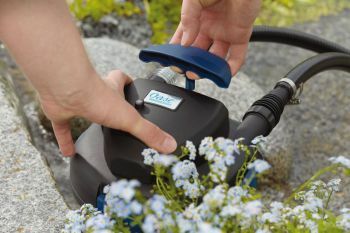 The BioPress filter set offers a cost effective alternative to the superb OASE FiltoClear Pond Filters and features an easy-clean handle which allows the internal filter foams to be cleaned without the need to remove these or handle the foams themselves. 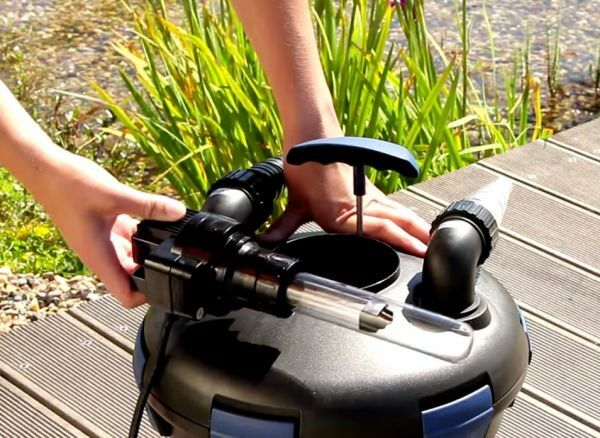 The lid is fitted with an inspection window to view the UV Clarifier bulb operation and the 9w UVC will help tackle problematic green water caused by single celled algae growth. BioPress filter sets can be used to supply the cleaned water to a small waterfall or watercourse if desired and the filter body can be buried in soft ground to disguise if required. Suitable for ponds up to 6,000 Litres, Fish Ponds up to 3,000 Litres or Koi Ponds of 1,500 Litres. 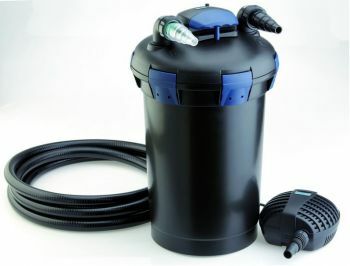 BioPress 6000 Set includes FP2500 Filter Pump and integrated 9 Watt Ultraviolet Clarifier. 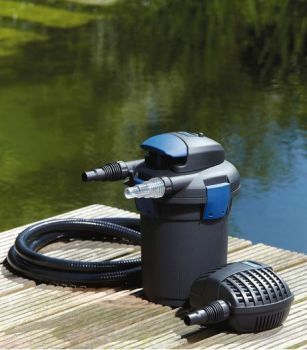 Supplied with 5 metres of 1" internal diameter smooth bore flexible pond hose. 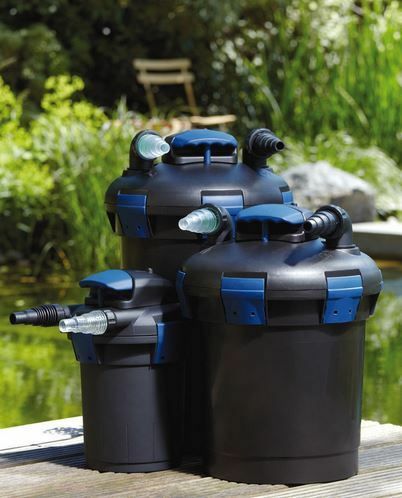 Filter complete with easy-clean handle and quick release lid catches for maintenance. As stated, it has only been install for a week, so not able to give a full report of its capabilities but seems to be working well.